Taylor Swift just made a fan feel much better by sending some flowers and a thoughtful handwritten note at the hospital. Taylor Swift just made a fan feel much better by sending some flowers and a thoughtful handwritten note at the hospital. 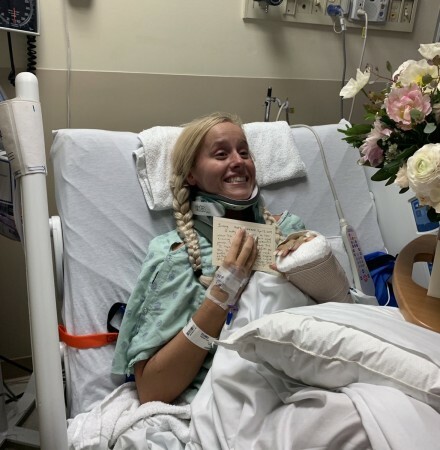 Lindsay Sizemore, the fan who suffered from a bad car accident, received some of the best remedies at the hospital thanks to Taylor Swift! Taking to Twitter, Sizemore shared the story of how Taylor shared a beautiful bouquet and a thoughtful note. "I finally stopped crying long enough to post that Taylor Swift just sent me flowers and a handwritten note," and added, "I'm still in complete utter shock. thank you so much. I love you endlessly, you have NO IDEA how much this meant to me. see u on tour bb." Calling it the sweetest thing ever, the fan told E! News, "I never in a million years expected to receive flowers from her. I don't know how she even knew of me or me being in a neck brace or a bad car accident." She even went ahead and called her a magical fairy godmother adding, "She has eased the pain of a broken leg, neck, back, finger and 11 ribs." This is not the first time that Sizemore has been rescued from the dark times in her life because of the Shake it Off singer. She quoted, "She has helped me so much through the past 11 years with her music. She's helped me through heartbreaks when my world had fallen apart and she's also made good days better with her music." The 29-year-old singer has often expressed her generosity through the means of donation and reaching out to fans. Earlier this week, it was revealed that Taylor donated about $113,000 to an LGBTQ organisation going by the name, Tennessee Equality project. Chris Sanders, who is the executive director of TEP praised her philanthropy and shared a photo of Swift's letter to the organisation on their official Facebook page. Her letter read, "I'm writing you to say that I'm so inspired by the work you do, specifically in organizing the recent petition of Tennessee faith leaders standing up against the 'slate of hate' in our state legislature," Swift began her letter. "Please convey my heartfelt thanks to them and accept this donation to support the work you and these leaders are doing." It is nice to see how involved Taylor Swift is in her fans' life.